President Trump pardoned his second turkey, a 39-pound white wonder named Peas. The animal rights activist organization PETA, however, is calling for an end to the "inflated and misguided tradition" that treats innocent turkeys like criminals. "Turkeys don’t need to be 'pardoned,'" laments PETA on the organization's website. "They aren’t serving five to 10 for armed robbery." PETA uses the moment for some cheeky humor by suggesting the turkeys could theoretically be charged with drug crimes for all the "growth hormones and antibiotics that farms pump into these birds during the few short months of their lives." The turkey pardon is all a scam, PETA says, because the turkeys do not live long after the president waves his hand of pardon over their white feathers. "They don’t leave prison through Intake and Release, collect their belongings, and go home to their families," PETA says with a serious face. "Because they’ve been bred, fed, and drugged to grow much larger much more quickly than they ever would in nature, chances are good that they’ll die of heart failure while President Trump is still in office." Indeed, last year's turkey pardons, Wishbone and Drumstick, have already passed on to the great turkey meadow in the sky along with the other previous pardons. This year's turkeys, Peas and Carrots, will be headed toward Virginia Tech where they will be watched over by poultry science students. In the end, PETA advises all Americans to participate in their own turkey pardon this year by going vegetarian. The article even provides an ad for a meat-less turkey from Trader Joes. The animal rights org, Mercy for Animals, was also quite forceful in their call to end the turkey pardon tradition, decrying the fact that Americans kill over 45 million turkeys for Thanksgiving dinner every year. The fact is, over 45 million turkeys are killed for Americans to eat at Thanksgivingeach year. And like most animals raised and killed for food, turkeys are put through hell at factory farms from the moment they’re born until they’re violently killed. These animals never get to know the love of their mothers or feel the sunlight on their backs or the grass beneath their feet. Instead, they are subjected to mutilations without painkillers and crammed by the thousands into dark, windowless sheds. The National Turkey Federation became the official turkey supplier to the first family in 1947 and the formal turkey presentation ceremony has been around since President Harry Truman. Truman was the first to accept a turkey from them -- however, he did not spare the bird. Pardoning the turkeys didn't catch on right away. Even though President Gerald Ford pardoned President Richard Nixon, neither one of them decided to officially pardon any turkeys. 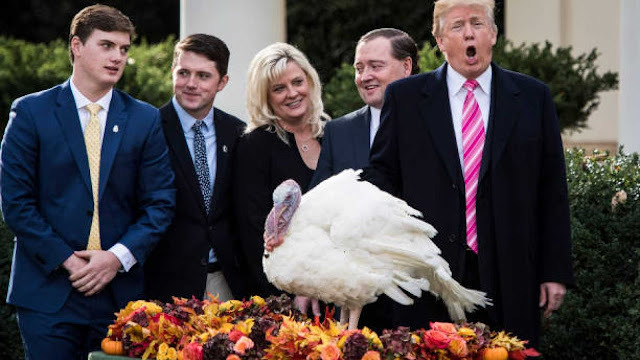 During his speech at the ceremony on Tuesday, President Trump referred to the turkey Peas as one of the most beautiful turkey's he's ever seen before pardoning him. "That turkey is so lucky. I've never seen such a beautiful turkey," Trump said. In true Trumpian fashion, the president also wished America "a very, very happy Thanksgiving."